So recently I said goodbye to Nars Sheer Glow foundation, Illamasqua Masquara and the Shiseido Mascara Base and here's what products I replaced them with. First up, lets talk foundation. I purchased the Chanel Perfection Lumière quite a while back when I was in New York. The packaging is perfect. The glass bottle has a pump built in (I wish Sheer Glow did) making dispensing the product easy peasy. The colour is a brilliant match for my skintone. What I tend to go for in a foundation is a heavier coverage with a matte (ish) finish. The Chanel sales girl said this would be the best for me. This foundation is very matte when you apply it-far more matte than Estee Lauder Double Wear or Nars Sheer Glow. Because of that it can look a bit flat so I have taken to mixing in 1 pump of Mac Strobe liquid before I apply it. It definitely applies best with a brush-I used the Real Techniques Expert Face brush most of the time. I find it difficult to blend with my fingers because it dries so fast. It gives good coverage but still feels lightweight on the skin. It is long lasting but I do need to powder the foundation a couple of times a day to blot down shine, the matte effect doesn't seem to last on me. However that may be down to the primer I am using as that is a 'radiance giving' primer. It's an ok foundation but I am not loving it and this isn't my holy grail foundation. I really really liked the Illamasqua Masquara (far more than I expected to to be honest) and had high hopes for the Guerlain Noir Couture as it's replacement. The packaging is lovely-quite a heavy black and silver tube-very sleek looking. The mascara has a 'three ball' brush allowing you to use the wand horizontally and vertically. To be honest I don't see any benefit from the brush shape over a normal wand. The formula is creamy and not overly wet, but a lot of product gathers on the end 'ball' tip so you need to wipe that away. The mascara claims to offer 4 benefits-intense volume, strong curl, infinite length and complete lash care with the patented 'Lash Booster Expert Complex'. Again, I don't feel this mascara lives up to those claims. I get a little bit of length and it is very good at separation but my lashes look thin and spiky with this mascara on. I also don't get the 'intense black lashes' look that I like as it doesn't volumise very well. I'm disappointed. Whilst I haven't really experienced significant smudging or flaking with the mascara, it definitely seems to 'fade away' during the day, leaving your lashes feeling a bit naked. I thought maybe adding a mascara primer might help so whipped out my Diorshow Maximizer. I was unimpressed with the formula of the Shiseido version-I didn't feel it deposited much product onto the lashes or gave much extra 'oomph' to my mascara. And straight off the bat I am going to say that I feel the same about this Dior version. The plastic brush is quite long and is quite stiff and inflexible. Nevertheless I can definitely 'see' this primer on my lashes because it is white. But the formula is quite thin and I don't see that plumped up effect I saw when I used the Mac Prep and Prime mascara base. The Mac primer literally doubled the thickness of my lashes. The Mac Prep and Prime base was a thicker consistency though, the Dior one feels feather light on the lashes. The reviews are so good of this primer so I am going to stick with it and maybe trying adding a bit more each time I use it. And also try it with another mascara. Not glowing reviews of any of the products I am afraid but these are my initial impressions after using them daily for a couple of weeks now. Shame they're not massive pluses but maybe you'll notice a difference after a while! Hey Stacey, aww so sorry to hear these are more like misses for you! 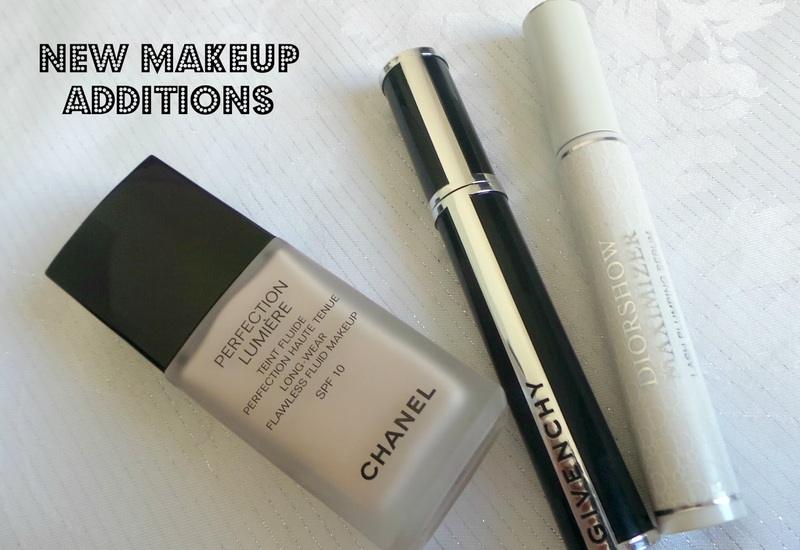 I've tried the Givenchy mascara and the Dior primer. The former is too wet to hold my curl all day, but I'm already on the third or fourth tube of the Dior primer and I love it! It seems like whichever mascara I use, this primer makes it so much better. I find it deposits enough product pretty much with one pass as well, but than again mascaras are so personal!